Wooden doors are very beautiful and give an aesthetic look to your interiors or any other area where they are installed. 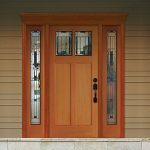 There are many types of door materials that have replaced wooden doors but the seamless beauty and appeal of wooden doors and windows are a class apart. These doors enhance the beauty of any area and they are very flexible, and therefore, easy to customize. Other materials can give that wooden finish or look but the sturdy feel of wooden doors cannot be replaced by any other material. 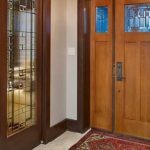 There are many benefits of installing these kinds of doors but there are also some disadvantages to wooden doors. One needs to weigh the pros and cons before deciding on the kind of door they want to install. These doors are easy to customize and can be carved into various designs and shapes due to their flexible nature. They are very effective in decorating any part of the house or any other building. These doors are very appealing and suit almost all interiors. Wooden doors appeal to all types of people, and hence, manufacturers try to achieve the wooden effect and texture in doors made of other materials. However, the elegance that real timber holds cannot be replicated. There are different kinds of wood that are available in a variety of textures and finish. We offer multiple designs to choose from and we also have a variety of wood types like teak, mahogany, oak, walnut, and pine. Each kind of timber has its own unique type of texture; some have knots, some have wavy lines, and some have grains. Timber doors can be quite expensive but timber is a very high-quality wood. It is a one-time investment and it will last for a very long time. The lasting of wooden furniture depends on the usage and how you maintain it. 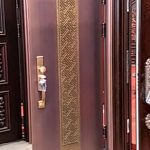 With all the beauty of wooden doors, the uniqueness and the flexible nature of wood, there are still many pros and cons that one should look into before investing in wood doors and wooden furniture. There are quite a lot of advantages to investing in doors and other furniture made out of timber. One of the advantages is their durable nature. They can last a very long time without losing their elegance and beauty. They do not rust over time like metal doors. Wood doors are a long-term investment that require simple maintenance steps like polishing. Wood doors, wherever installed, improve the overall aesthetics of the interiors. These doors are not sound proof, but they absorb sound vibration cutting down the level of noise by a large margin. Therefore, these doors can be very effective in playrooms for kids and for people who like to listen to loud music. These doors are ideal to be installed in apartment buildings where many people live on a single floor. Putting up wooden doors reduces the noise and makes the environment peaceful. These doors are energy efficient and provide some insulation in the room. They maintain a constant temperature and distribute air evenly in all directions. Some doors come with a fire rating for security purposes. It gives 20, 60 or 90 minutes options for fire resistance so that your interiors are safe and secure. Veneer is also trending these days; these are thin slabs of wood carved in various designs to give an exquisite appearance. They are not very expensive and are easy to install. Just like every other thing, there are disadvantages to wooden doors as well. With all the sturdiness and grandeur, there are a few things you should know about wooden doors before investing in them. These doors look very nice and add to the beauty of the interiors of any house, but due to their high cost they cannot be used everywhere. Wood doors are solid wood but they still do have gaps in between where they absorb the sound and give a soundproofing effect. But, they not only absorb sound waves but also the heat, dust and water around them. Just like water is an enemy of metal, so it is with wood. Long-term exposure to heat and water can harm the surface and damage the door. Wood doors can be installed on the exterior of the house but then it will require regular maintenance like varnishing and polishing. If not looked after properly it can get permanently damaged by termite attack. Sometimes the furniture looks perfectly fine and solid on the outside but is getting hollow from the inside thanks to termites. To prevent this, termite sprays are the best safeguard. Fine quality timber is very expensive and installing these doors can prove to be costly. Therefore, they are not used in offices or low-cost buildings. If you install wood doors in the office buildings, then it will increase the total expenditure. The regular maintenance will also be another regular cost you will have to take care of. Low-quality timber is also available in the market, but their life is very short and they erode very fast. Chipping of the surface is also an issue with timber doors and furniture. Wood doors are not all weatherproof and require a lot of maintenance if installed in the exteriors of any building. If not looked after properly, their life will deteriorate, and they can become hollow from inside which will permanently damage it. Wooden doors and furniture look very beautiful and elegant. With minor modifications, they give stunning results. For example, if you put glass in the wooden frames of the doors, it will completely change the appearance of the doors. These simple wood slabs when finished and polished properly give an extravagant look. Wood doors can be installed in any room according to the customer’s mood and requirement. Installing these doors in the interiors of your property is a good idea because wooden doors are very long lasting. Due to their high costing, they can be a deal breaker for an office building or low-cost apartments. If appearance is a priority for you then timber is your best choice because of its variety, longevity and grand appearance. But if you are on a limited budget and require quality doors then there are other options like fiber glass doors or MDF (Medium Density Fiber) boards.